Dr Ju Gosling aka ju90 reads ‘What’s Normal Anyway?’ at Ascension Church in Custom House on International Day of Disabled People 3 December 2013. Artistic Director Ju Gosling aka ju90 writes: 3 December 2013 was the United Nations’ 21st International Day of Disabled People, so it was fitting that we held a celebration of Disability Art, Culture and Human Rights during the afternoon. This time our venue was Ascension Church in Custom House, which is one of the oldest buildings in the area since it amazingly survived the Blitz intact. Being there reminded us that one of the biggest causes of disability worldwide is war – along with poverty, pollution and a disregard for health and safety precautions. All of these are issues that can be tackled by working together to change our world. Similarly, the barriers we face as disabled people can all be tackled if everyone works to achieve this. The UN set 2013’s theme for International Day as “Break Barriers, Open Doors: for an inclusive society and development for all”. 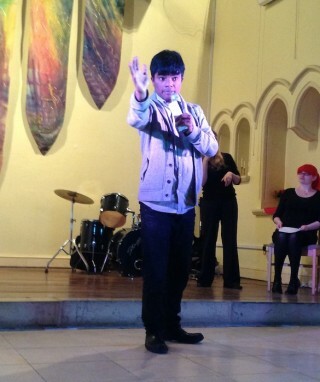 Don Biswas comperes on International Day of Disabled People 3 December 2013 at Ascension Church in Custom House. One of the more difficult aspects of directing this festival is the growing realization of just how many barriers disabled people face in simply accessing the arts. It has been rare to see an audience member who uses a PA, or a group who needs to be accompanied by a support worker. This is partly due to support not being available at all, but also to the lack of control that disabled people currently have over how we spend ‘our’ leisure time. Recent cut-backs in the Taxicard scheme have also had a serious impact. Taxicard users are generally having to choose to attend just one festival activity, rather than being able to come several times a week as desired. In fact, Taxicard users are now often leaving their homes only for medical and other practical reasons. Benefit cuts have also been impacting, particularly on people with mental health difficulties. They are all too often now being forced to survive on Jobseeker’s Allowance, rather than being correctly categorized as being disabled and unable to work. This leaves them without bus fares, let alone the funding they require for taxis if they feel unsafe going about on their own. It was fitting, then, that some of these issues were highlighted by the artists in a way — I hope — that was empowering rather than depressing. First, comedian and compere Don Biswas got us all giggling about our low employment and family status as disabled people. 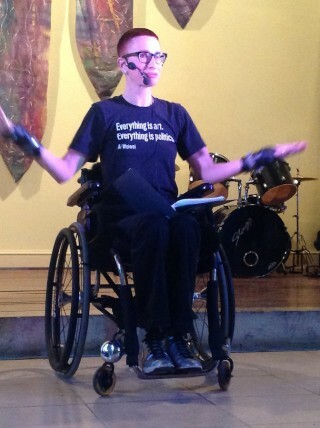 I read my 15-minute spoken-word piece, ‘What’s Normal Anyway?’, which looks at the anything-but-normal daily reality of many disabled people’s lives, but also how disabled and non-disabled people are working together using the UN Convention on the Rights of Disabled People to achieve change. Signdance Collective International, who performed at both our Paralympic and Disability History Month festival activities last year, returned with their very final performance of ‘Peyrot’s Stolen Dolls’. We feel very fortunate that SCI continue to support Together!, when they are much in demand across the world for their unique blend of dance, storytelling and Sign. I was particularly pleased to be able to programme Act Up, a locally based inclusive community theatre company. Ably led by carer Yvonne Brouwers, the company devises powerful dramas from the lived experiences of the company members. 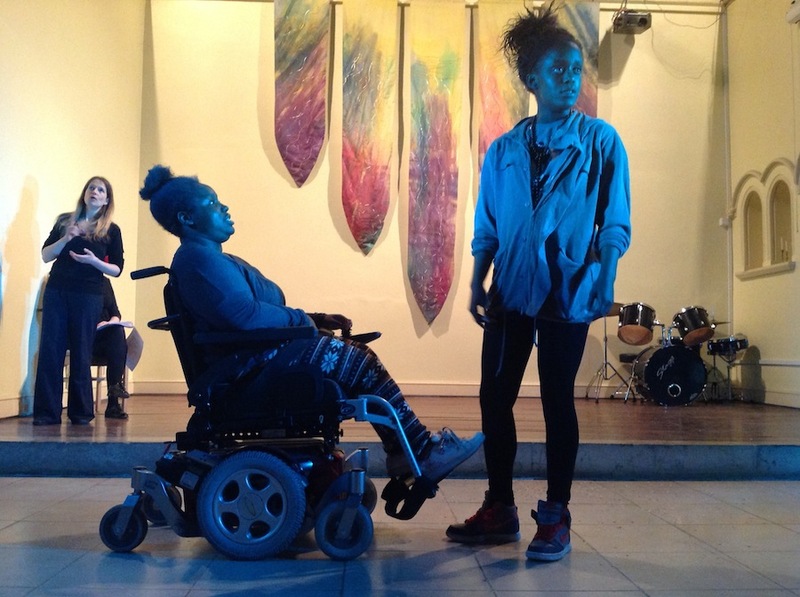 Their play ‘Changing Attitudes’ conveys both the discrimination that disabled people face, and the ability that we all have to change attitudes and end this. We all left knowing that, together, we can change our world. Members of Act Up theatre company in Changing Attitudes, performed at Ascension Church in Custom House on International Day of Disabled People 3 December 2013.